Robert Fulghum, author of All I Need to Know I Learned in Kindergarten, wrote: “Live a balanced life – learn some and think some and draw and paint and sing and dance and play and work every day some.” Wise advice! Balance affects many subjects: checkbooks; work and family; budgets; scales; tires; meals; investments; we even have shoes called New Balance. The message is out there. Balancing our work, play, and other activities may not be easy, but it is possible. It is worth a conscious effort. Balance is an important aspect of good mental health. It isn’t an exciting topic but it affects us daily. For example, most of us would agree that exercise is good. But, if exercising consumes our thoughts and a big portion of each day, our joints start hurting, we get nothing else done, and we spend less time with friends and family. In this scenario, exercising is out of balance. Overdo anything positive for an extended period of time and it can become a negative. If we sleep seven or eight hours we have 16 or 17 hours left in each day. If we work an eight hour day, that leaves eight or nine hours. What occupies those hours? Do we control our time, or does the day end as we wonder where it went? Have we allowed time to call a friend; to sit and relax; to choose nutritious food; to read; to walk; to visit? 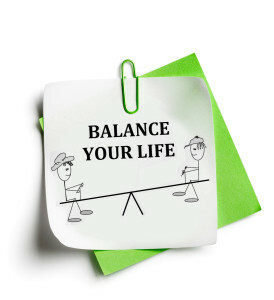 Remember the old saying, “All work and no play makes Jack a dull boy!” Opposite of that, there are lyrics by Hilary Duff: “No work all play – what a mistake.” These examples are referring to the concept of balance. Our bodies know if we are in or out of balance: Insomnia, headaches, stomach aches, hives, angst, pains, short tempers, and declined mental focus, just to name a name a few. Be thoughtful of how you spend your time. Identify the barriers that prevent you from balancing your time and activities. Write down what you notice, evaluate your notes, and make the necessary changes. A balanced life is possible, and it would contribute to how often you smile; how well you sleep; how compassionate you feel; and to your level of self-esteem. Give it a try. You have benefits waiting.